This blog is not my first experience of handling website but it is first I had established from scratch and for myself. Which gave me excellent playground to try and improve it. And web tech being not really my field madе it more interesting. Almost accidentally I stumbled into YSlow which is provided by Yahoo to help people optimize their web sites (and seems that they have a lot to say about it). It provides information on "weight" and contents of any web site and list of 13 suggestions to improve. Depending on number of suggestion fulfilled performance score (F to A, 0 to 100) is calculated. Yahoo has page with explanations which YSlow links to and I won’t repeat them. Instead I want to focus on how to fulfill them since existing info on YSlow optimizing seemed very fragmented to me. Note – I have Apache-based hosting which seems to allow me setting plenty of options freely so methods listed are those worked with my configuration. Also a lot of .htaccess editing is required, always backup it and don’t touch if unsure. That was the hardest part. 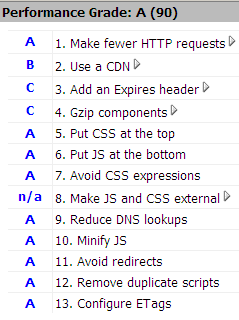 Every html, css, js, image or whatever is separate file and thus requires separate HTTP request from browser to server. I edited my CSS to get rid of small eye-candy background images. I removed tabs in top sidebar (never liked them) – allowed me to cut two scripts and one css file. I removed contact form – YSlow showed me that form was using two scripts (60Kb size in total) and made them included on every page! I CSS-scaled AddThis "plus" image and used single file for it in different places. Also I noticed that images in posts were relatively heavy – took some cropping and heavy optimizing (going to have separate post on this) to lower their size. This one requires some configuration, look here for instructions. After that this showed me external elements I had, served as hint to move AddThis images to my hosting instead of hotlinking them as default. ExpiresDefault "modification plus 1 week"
This one also took a lot of time. There are numerous ways to implement this and I had got at least 10 different pieces of code to enable it from googling. Adding following to .htaccess worked for me. Also it seems that WP Super Cache plugin breaks gzip compression at times. Makes sense if its’ goal is to reduce server CPU load even at the cost of bandwidth. Since I cut all JS except AdSense one I had nothing to improve. I moved (or cut) everything external (again except AdSense) so had nothing to improve. Nothing to improve yet again. And again everything was perfect. Sounded rather scary but took only following in .htaccess to implement. I was very impressed with final result. 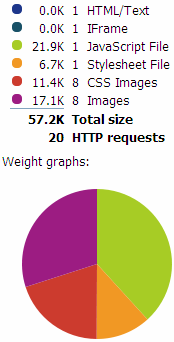 Things like expire and etags are not really noticeable but my index page went from more than 150+Kb size and 30+ HTTP requests to 32Kb and 20 requests. Without much visual difference I significantly reduced size and load time. YSlow is very nice tool. Clearly not all of suggestion really matter for small-to-medium sites but it makes easier to find "fat" parts of site and other choke points. My final YSlow score is A(90). Slightly spoiled by external AdSense script and that I couldn’t make server gzip my CSS (installed CSS compress plugin to make up for it).